This morning in Huntington at 7:15AM it’s currently 61 degrees under mostly cloudy skies. Winds are calm. Relative humidity is 99%, dewpoint 61, barometric pressure 29.93″. Yesterday’s high was 79, and overnight low was 58. Humid and unsettled weather will continue through the weekend. We’ll see mostly cloudy skies today with a slight chance of showers this morning, then scattered showers with isolated thunderstorms more likely this afternoon as a shortwave trough moves into the region from the Great Lakes. Highs will be in the upper 70s with light and variable winds, becoming westerly around 10 mph this afternoon. Chance of rain is 50%. Tonight should be cloudy with scattered showers and isolated thunderstorms. Lows will be in the lower 60s with light and variable winds. Chance of rain is 50%. Saturday should be cloudy with a chance of showers in the morning, then showers and thunderstorms likely in the afternoon. Highs will be around 80 with south winds around 10 mph. Chance of rain is 60%. Saturday night should be cloudy with a chance of showers and thunderstorms. Lows will be in the mid 60s with south winds around 10 mph. Chance of rain is 50%. Sunday’s looking partly sunny with a chance of showers. Highs will be in the lower 80s with light and variable winds. Chance of rain is 40%. 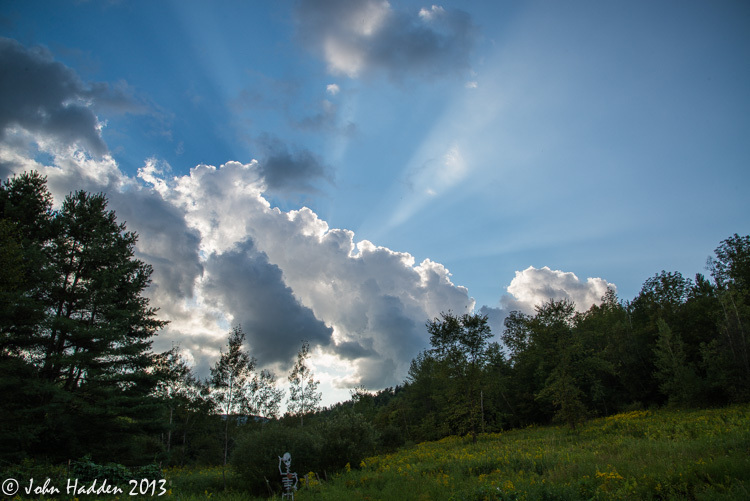 Sunday night should be partly cloudy with a chance of showers. Lows will be in the mid 60s. Chance of rain is 50%. Last year on this date we had a high of 80 and a low of 45. Burlington norms for this date are highs of 77°F and lows of 56°F. Moon is a waning crescent, 23d 13h old with 31% illumination. Crepuscular rays (which we’ve called “lavendrills” but I can’t find a reference for that word…) stream from behind lovely cumulus clouds yesterday afternoon. Humid weather and mountain uplift are perfect for these kinds of clouds to form in the afternoon heat. We can expect to see more today along with some rain. Nikon D600, Nikon 24-120mm lens @ 24mm, ISO 100, f/13, 1/160″ exposure. This morning in Huntington at 6:45AM it’s currently 60 degrees under partly cloudy skies. Winds are calm. Relative humidity is 99%, dewpoint 60, barometric pressure 29.99″ and rising. We picked up 0.19″ of rain yesterday afternoon. Yesterday’s high was 82, and the overnight low was 60. A strong and stagnant high pressure ridge to our west will continue to feed muggy and unstable conditions into our region for the next several days. We’ll see partly sunny skies with scattered showers and isolated thunderstorms this afternoon. Highs will be in the mid 70s with light and variable winds. Chance of rain is 40%. Tonight should be partly cloudy with scattered showers and isolated thunderstorms until midnight. Lows will be in the upper 50s with light and variable winds. Chance of rain is 30%. Friday should be partly sunny with a slight chance of showers and thunderstorms in the afternoon. Highs will be in the upper 70s with light and variable winds, becoming westerly around 10 mph in the afternoon. Chance of rain is 20%. Friday night should be mostly cloudy with a chance of showers and thunderstorms. Lows will be in the mid 60s with south winds around 10 mph. Chance of rain is 30%. Saturday’s looking mostly cloudy with a chance of showers and thunderstorms. Highs will be in the lower 80s with south winds 10 to 15 mph. Chance of rain is 40%. Saturday night should be mostly cloudy with a chance of showers and thunderstorms. Lows will be in the mid 60s. Chance of rain is 50%. Record high was 92°F in 1953. Tomorrow will be 2m 56s shorter. The Moon is a waning crescent, 22d 13h old with 40% illumination. 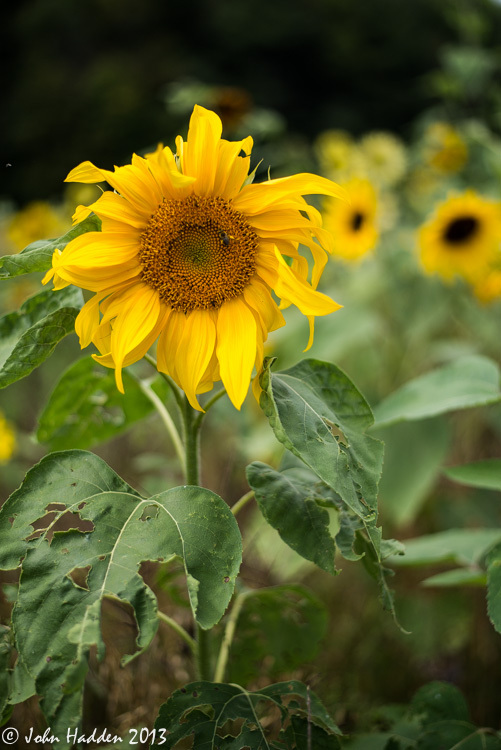 Nothing says late summer like sunflowers. This one was down next to the road by the Moultrop farm in Richmond. Nikon D600, Nikon 50mm lens, ISO 100, f/1.8, 1/2500″ exposure. This morning in Huntington at 6:45AM it’s currently 61 degrees under mostly cloudy skies. Winds are calm. Relative humidity is 99%, dewpoint 61, barometric pressure 29.87″. We picked up 0.02″ of rain in the past 24hrs. Yesterday’s high was 80, and the overnight low was 61.
region this afternoon and evening. We’ll see partly sunny skies this morning and a chance of showers and thunderstorms this afternoon. Highs will be around 80 with light and variable winds, becoming northwesterly around 10 mph this afternoon. Chance of rain is 40%. Tonight should be mostly cloudy with a chance of showers and thunderstorms until midnight, then partly cloudy after midnight. Lows will be in the upper 50s with north winds around 10 mph until midnight, becoming light and variable. Chance of rain is 40%. Thursday should be partly sunny with highs in the mid 70s and light and variable winds, becoming northerly around 10 mph in the afternoon. Thursday night should be partly cloudy with lows in the upper 50s and northeast winds around 10 mph. Friday’s looking mostly sunny with highs in the upper 70s and northwest winds around 10 mph. Friday night should be partly cloudy with lows around 60. Last year on this date we had a high of 75 and a low of 53. We picked up 0.32″ of rain. Moon is in its last quarter, 21d 13h old with 49% illumination. 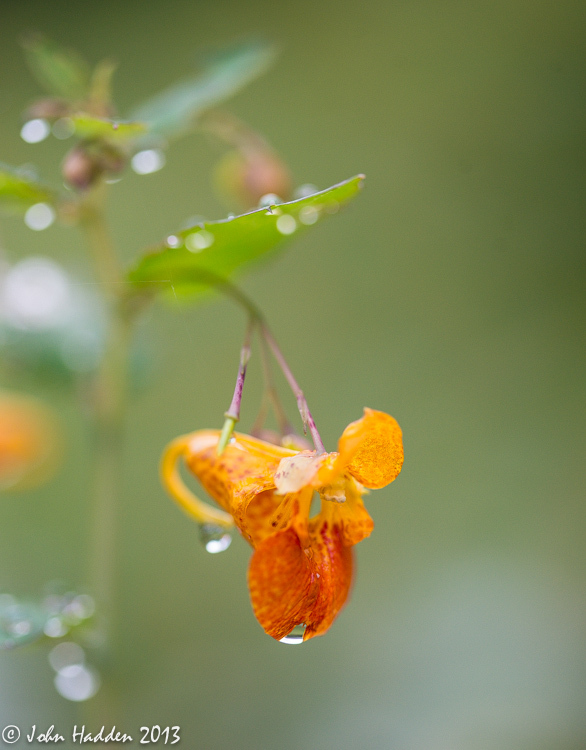 Jewel Weed (also known as Touch-Me-Not) is in bloom and fast going to seed. The seed pods of this plant are quite entertaining as they burst when touch (hence the alternate name…) Jewel Weed is also an important herbal remedy for skin irritation. You can read more about it here. Nikon D600, Sigma 105mm lens, ISO 800, f/4.2, 1/2000″ exposure. This morning in Huntington at 7:05AM it’s currently a muggy 66 degrees under overcast skies. Winds are calm. Relative humidity is 99%, dewpoint 66, barometric pressure 29.87″ and rising. We picked up 0.42″ of rain in the past 24hrs. Yesterday’s high was 71, and the overnight low was 64. We’re in for a stretch of unstable weather and above normal temperatures for the next several days as a series of shortwave troughs move through the region. We’ll see cloudy skies this morning, then partly sunny skies with a slight chance of showers and thunderstorms this afternoon as diurnal heating works on unstable air. Highs will be in the lower 80s with light and variable winds, becoming northerly around 10 mph this afternoon. Chance of rain is 20%. Tonight should be partly cloudy with a slight chance of showers and thunderstorms until midnight. It’ll be muggy with lows in the lower 60s and north winds around 10 mph until midnight, becoming light and variable. Chance of rain is 20%. Wednesday should be partly sunny with a chance of showers and thunderstorms, mainly in the afternoon. Highs will be in the upper 70s with light and variable winds, becoming northwesterly around 10 mph in the afternoon. Chance of rain is 30%. Wednesday night should be partly cloudy with a chance of showers and thunderstorms. Lows will be in the upper 50s with northeast winds around 10 mph. Chance of rain is 30%. Thursday’s looking mostly cloudy with a chance of showers and thunderstorms. Highs will be in the mid 70s with north winds around 10 mph. Chance of rain is 30%. Thursday night should be partly cloudy with lows in the upper 50s. Last year on this date we had a high of 79 and a low of 59. The Moon is waning gibbous, 20d 13h old with 59% illumination. 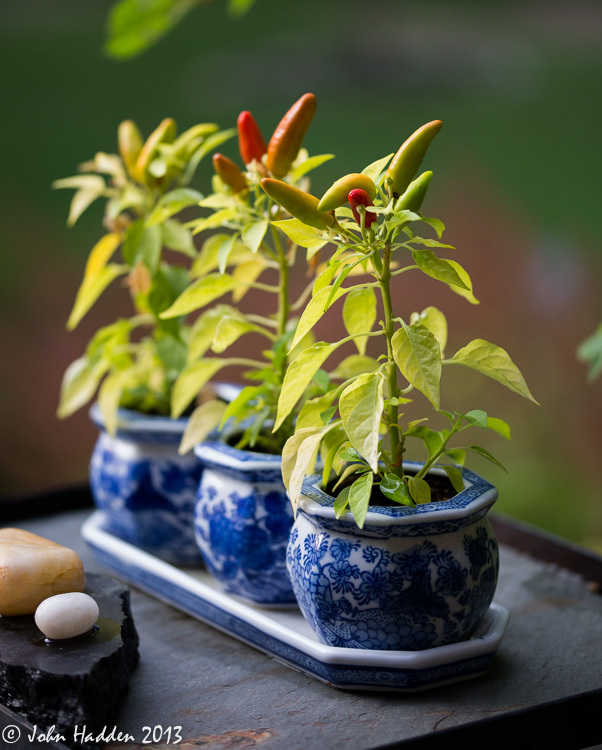 These tiny chiles are getting ready to pick on our back patio! Nikon D600, Sigma 105mm lens, ISO 400, f/3.2, 1/320″ exposure. This morning in Huntington at 6:45AM it’s currently 61 degrees under overcast skies. Winds are calm. Relative humidity is 98%, dewpoint 60, barometric pressure 30.00″ and falling. We picked up 0.14″ of rain overnight. Yesterday’s high was 76, and the overnight low was 59. We’ll see cloudy skies with scattered showers and isolated thunderstorms this afternoon as a warm front moves through the region out of the northwest. Highs will be in the upper 70s with southwest winds around 10 mph. Chance of rain is 40%. Tonight should be mostly cloudy with scattered showers with isolated thunderstorms until midnight, then a slight chance of showers after midnight. Lows will be in the lower 60s with light and variable winds. Chance of rain is 30%. Tuesday should be partly sunny with a slight chance of lingering showers in the morning. Highs will be around 80 with light and variable winds. Chance of rain is 20%. Tuesday night should be partly cloudy with lows in the lower 60s and light and variable winds. Wednesday’s looking partly sunny with a chance of showers and thunderstorms as a low pressure system edges into the region from the Great Lakes. Highs will be will be in the upper 70s with light and variable winds. Chance of rain is 40%. Wednesday night should be mostly cloudy with a 40% chance of showers. Lows will be in the upper 50s. Last year on this date we had a high of 84 and a low of 59. The Moon is waning gibbous, 19d 13h old with 69% illumination. Vibrant orange, red and green make this photo pop! 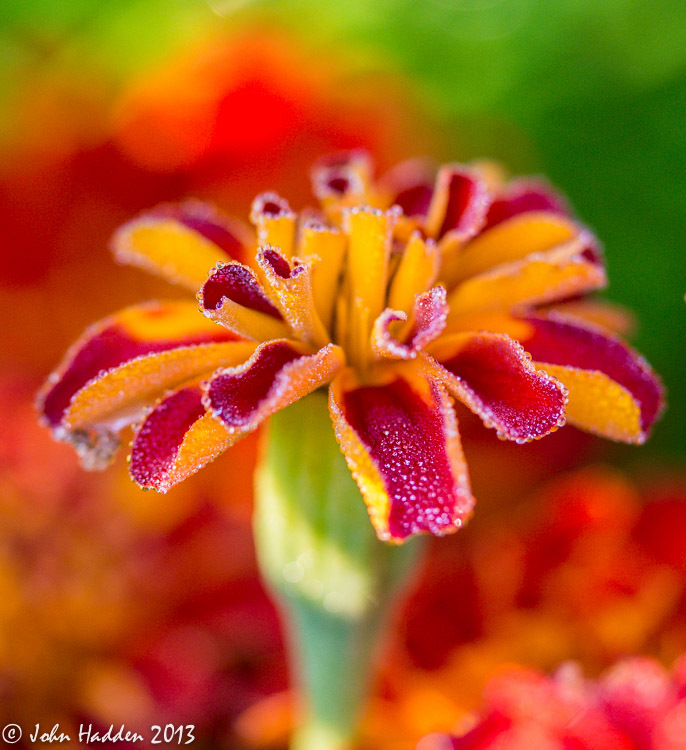 A marigold catches early morning sunlight on our front patio. 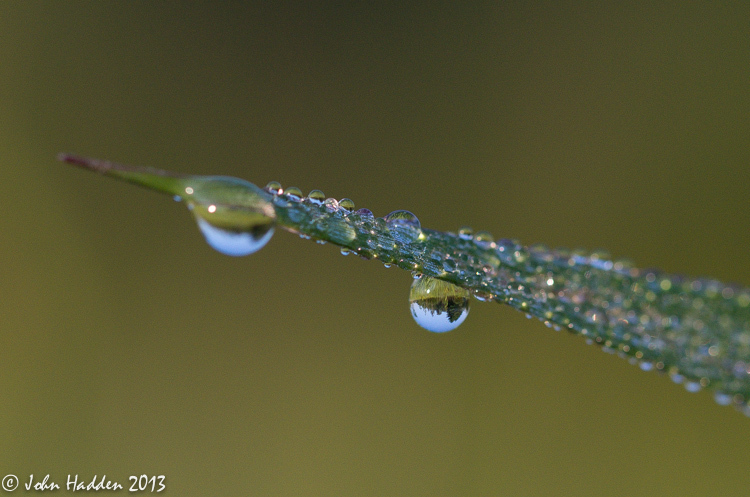 Morning dew beads on a blade of grass in our front field. This morning in Huntington at 8:30AM it’s currently 53 degrees under clear skies. Winds are calm. Relative humidity is 99%, dewpoint 53, barometric pressure 30.32″ and rising. Yesterday’s high was 70, and the overnight low was 42. High pressure will deliver a perfect late summer day today. We’ll see sunny skies with highs in the mid 70s and light and variable winds. Tonight will be clear and cool with lows in the upper 40s and light and variable winds. Sunday should be mostly sunny with highs in the upper 70s and light and variable winds. Sunday night should be partly cloudy with lows in the upper 50s and light and variable winds. An upper level disturbance and associated cold front will arrive Monday bringing the next chance of showers. Highs will be in the mid 70s with south winds 10 to 15 mph. Chance of rain is 60%. Monday night should be mostly cloudy with a chance of showers. Lows will be in the lower 60s. Chance of rain is 50%. Last year on this date we had a high of 83 and a low of 55. Burlington norms for this date are highs of 78°F and lows of 58°F. Record low was 40°F in 1923. Moon is waning gibbous, 17d 14h old with 85% illumination. Drops of dew reflect the trees, field and sky like tiny gazing balls. Once again, getting in close reveals worlds! 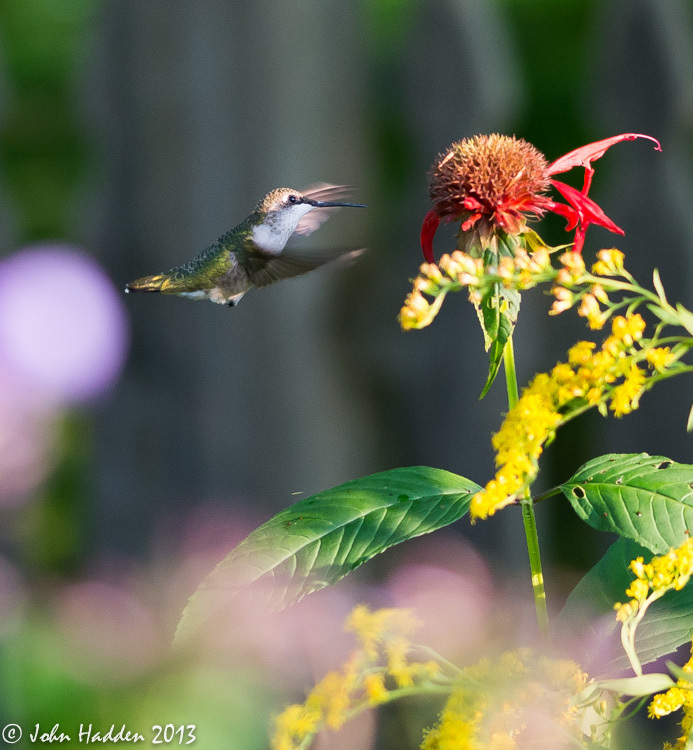 A ruby-throated hummingbird gets the last of an aging bee balm’s nectar. This morning in Huntington at 7:15AM it’s currently 58 degrees under overcast skies. Winds are calm. Relative humidity is 97%, dewpoint 58, barometric pressure 29.95″ and rising. We picked up 0.78″ of rain yesterday evening. Yesterday’s high was 84, and the overnight low was 58. Cool Canadian high pressure is building into the region this morning and will set the stage for a beautiful weekend. Morning clouds should clear by midday, and we’ll see partly sunny skies with highs in the lower 70s and north winds 10 to 15 mph. There is a slight chance of a late afternoon sprinkle north and east. Tonight should be clear with patchy dense fog. Lows will be in the mid 40s with north winds around 10 mph until midnight, becoming light and variable. Saturday should be sunny and seasonal with highs in the mid 70s and light and variable winds. Saturday night should be clear with lows in the upper 40s and light and variable winds. Sunday’s looking sunny with highs in the mid 70s and light and variable winds. Sunday night should be mostly clear with lows in the mid 50s. Last year on this date we had a high of 81 and a low of 52. We picked up 0.22″ of rain. Record high was 93°F in 1947. Record low was 43°F in 1988. The Moon is waning gibbous, 16d 13h old with 93% illumination. This was a lucky shot. I was out in our side garden with my 105mm macro lens on my camera taking close up shots as the morning sun peeked over the hills. I heard this hummingbird zipping about in the flowers nearby and managed to get a quick shot of her. There are a lot of hummingbirds around this year it seems, and they’ve been quite active no doubt stocking up for the upcoming southern sojourn. Nikon D600, Sigma 105mm lens, ISO 800, f/3.5, 1/500″ exposure.